Almost Everyone’s Guide to Science is a science book for non-scientists. John Gribbin is a popular-science writer who has a clear writing style, yet his words keep you turning page after page. However let me state right off the bat that the book assumes some familiarity with many of the scientific concepts. As such, the book is not for the uninitiated. This issue is heightened by the fact that the book contains no illustrations or photos. While this may not be a real issue for the scientifically savvy, it may be challenging to the rest. The book starts by some history and background to major scientific breakthroughs and achievements. It then progresses to the atomic theory, quantum mechanics and the physics revolution around the turn of the 20th century. The narrative takes one deeper and deeper into the physical world. Specifically, we look at the atom from its early models, down to the discovery of its components. Gribbin then goes on to describe the electrical and chemical properties of atoms and what makes an element active and some inert. This progression takes us well into the realm of chemistry and chemical reactions. Organic molecules are described and the difference between organic and inorganic is clarified. At this point the book has covered the Hydrogen, Carbon and Oxygen atoms to a great degree. Gribbin explains why the Carbon atom is so unique in terms of its ability to make bonds and participate in chemical reactions unlike any other element. The last section of the book takes us through yet another transition from the world of simple molecules to polymers and very, very complex molecules. This transition is not trivial, as it takes us from the realm of chemistry into that of biology, or at least molecular-biology. RNA and DNA are the building blocks of life, but until we get there, we need to understand what chemical matter is necessary and how they are formed. The complex elements that form the basis of DNA is explained and the book concludes with DNA and self-replicating molecules with millions upon millions of atoms in each one of them. Overall, the book didn’t disappoint. At first I thought the length at which history and physics was presented put the book squarely in the physics department. I even thought at one point that he ought to have called the book “Almost Everyone’s Guide to Physics“. At least until we got to ions, chemical reactions and solidly into chemistry. However, I was delighted to see the transition and the connections made between these scientific domains. This is unlike any other book that I’ve read. Gibbin doesn’t disappoint. The book is well researched and well written. The narrative is fairly easy to follow, even when the subjects gets complicated and a bit hard to describe by words. 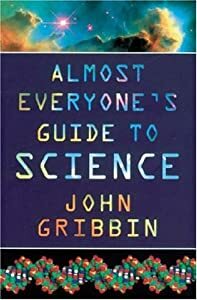 This was my second book by Gribbin, the first being Richard Feynman: A Life in Science, and I must say both were very good reads. The contents of this site are the personal opinions, views, ideas and products of Ashod Nakashian, and are not intended to malign any religion, ethnic group, country, race, government, law enforcement officer, club, organization, company, insect or individual or anyone or thing, especially those with the ability and desire to fight back. Text, code and photos copyright Ashod Nakashian, unless stated otherwise. Do not use without permission. Do not hot-link.